[EverestX] works in the Security industry and is often required to recover or penetrate various systems for a variety of reasons. He wanted to create an all-in-one tool that he could easily carry from job to job which would provide him with several essential functions. He required that the device house a bootable operating system through which he can perform his work, have an Internet connection capable of injection, and have enough storage capacity to back up passwords, images, etc. He decided to build the system inside an old IBM M-type keyboard, which provides a solid typing experience and plenty of real estate for his various components. After converting the keyboard from PS/2 to USB, he installed a USB hub along with his flash drive and WiFi card. Once he gets everything reassembled, it should prove to be a pretty stealthy and useful piece of equipment. A word to the wise – if you happen to see someone sneaking around your office with a 20-year old Type-M keyboard, be wary. [Vincenzo] wanted to read some 82S129 bipolar proms, and why not, they were very common in the 1980’s arcade scene. The problem is that its kind of an odd ball part now, and typically only (even) more expensive EPROM programmers can read them. An Arduino, breadboard and some quick scripting quickly takes care of that problem with this Arcade Rom Reader. You stick the prom in your breadboard, and wire it up to the appropriate ports and pins of the Arduino, which bit bangs the prom and returns the results though the serial connection of the Arduino. Using a terminal program on the pc side you capture the text and use a script to convert the ascii values into a binary nibble format and save as hex. This makes it much easier for us to dump roms from old arcade boards, because you never know when you might run across an old Polybius arcade board on your next outing to the salvage or scrap yard. Join us after the break for all the details and as always comments! [Jordan] writes in to show us his hacked up car stereo. [Jordan]’s 2004 Subaru, like many of our cars, does not offer any kind of auxiliary input, and aux-in/mp3 adapters tend to run on the not so cheap side of the price scale. Even a replacement head unit was too rich for his blood. So it was time to wire something to the old head unit. On inspecting the radio’s PCB [Jordan] managed to locate the traces that carry audio from the FM receiver to the stereo’s amplifier. 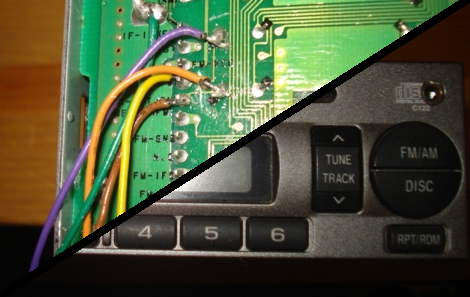 Most aux input hacks we have seen involve fooling the stereo into thinking some media is inserted, even if interfacing with the audio lines on the PCB. These require that the tape/CD functionality be altered, perhaps permanently. Even worse you may have to shlep around a blank CDR with a bunch of tracks on it! All just to fool the stereo into enabling audio output. Instead [Jordan] targets the audio lines from the FM stereo, since radio is always enabled when active. Once the audio traces are located they are severed and bypassed with a 1/8″ stereo plug. This setup allows the FM audio signal to pass through the connector when disconnected, and cuts off any radio audio once your mp3 player is. We have seen this same method used on a vintage stereo hack as well. Nice work! [Ginge] sent in this fun little project. He gave himself 3 hours to complete a hack (not including research time) and managed to come up with this cool activity meter. He handles the entire project like it is some kind of contest. Ground rules are laid out, requiring practicality of the final product, minimum investment, and almost complete use of junk pile pieces. Using an old hard drive for the frame of the project as well as the “dial” part of the meter, he hacked together a system load/ hdd and proc activity meter. The brains of the project are an AVR and he even implemented some PWM to smoothing things out. He goes into some fair detail on the construction of the thing (was the writeup included in your build time? -50 points!). Even though he’s using a piece that he manufactures and sells (OSIF), you could probably figure out how to do it without. It always blows our mind to see the things that people dream up when playing with Lego. Given enough time, you could likely replicate almost any mechanical device with the right amount and type of blocks. [Friedemann Wachsmuth] recently wrapped up construction on a very impressive Super-8 movie projector with the help of his friend [Kalle]. The projector is fully functional, and is made completely from Lego aside from the reel spindles, the lens, and the lamp. As you can see in the video below the projector plays the film quite well, and even though it is only lit using an LED flashlight, it’s more than bright enough to get the job done. 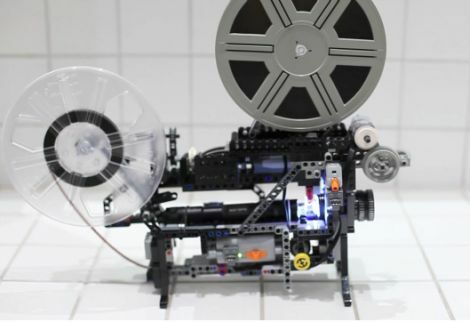 The projector boasts automatic film feeding, a 24 fps framerate, as well as fast rewind capabilities – all provided by just two small Lego Technic motors. You really need to watch the video to appreciate how much work went into this projector – it’s amazing. [Dino], who has become a regular face here on hackaday, sent us one of his weekly projects that we thought was pretty cool. He wanted to shoot some video of photographs to commemorate his late mother. The goal was to achieve the “Ken Burns Effect“, but in hardware instead of just doing it in software. 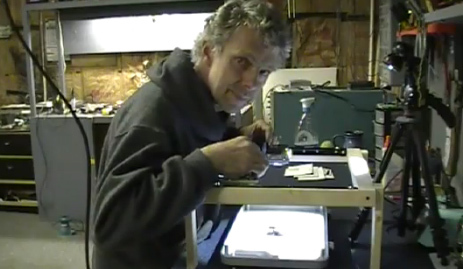 To do this, he built a 2 axis rig, very similar to many home made CNC machines we’ve seen. He used drawer rails and rollers and an old scanner for the parts. We admit, at first glance we weren’t too impressed with the resulting effect. It is a bit shaky as he moves the camera and the zooms and slides don’t have that perfect smoothness that we have come to expect from modern video effects. However, after a few minutes, it seemed so organic and pleasant that it won us over. This obviously isn’t what you would use for every project. This project, however, seems to fit perfectly. If you still don’t like the effect, you could certainly find uses for this rig aside from video. You could use it (with backlight) for batch converting slides or other images to digital. It would work perfect as a 2 axis paper cutter. What other uses can you come up with for a 2 axis un-motorized frame? You can watch the construction video after the break, and the result video on [Dino’s] page. [Paul] wrote in to tell us about some interesting Arduino latency issues he helped nail down and fix on the Arduino. 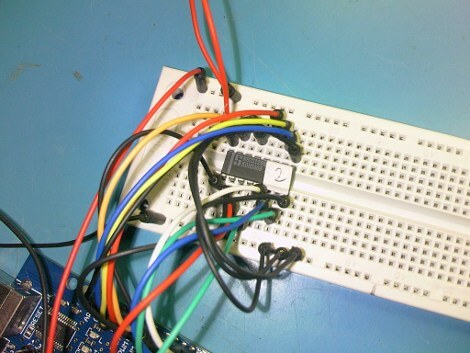 It seems that [Michu] was having some problems with controlling his Rainbowduino project we featured earlier this year, and he couldn’t quite figure out why he was experiencing such huge delays when sending and receiving data. Searching online for answers turned up very little, and since [Michu] was using Processing, the pair designed a set of tests to see what kind of latency was being introduced by Java. 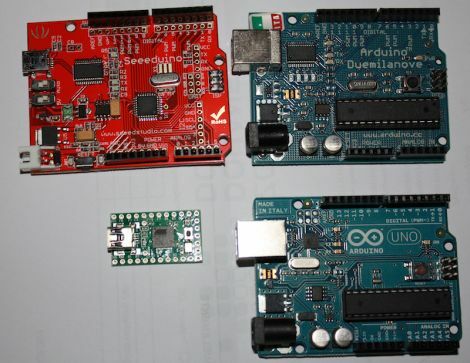 Pitting an Arduino Uno and an Arduino from 2009 against a Teensy 2.0, the tests gauged the latency of native data transfers versus transfers facilitated by Java via the rxtx library it uses for serial communications. The results were pretty stunning. While both of the Arduinos lagged behind the Teensy by a long shot, their latency values under Java were always 20ms at a minimum – something didn’t add up. [Michu] poked around in the rxtx code and found a mystery 20ms delay programmed into the serial library. It made no sense to him, so he changed the delay to 2ms and saw a drastic increase in performance when transferring less than 128 bytes of data. The pair’s fix doesn’t seem to affect latency when larger amounts of data (>1kB) are being transferred, but it makes a world of difference when manipulating smaller chunks of data. For the sake of disclosure, it should be noted that [Paul’s] company produces the Teensy mcu.